It's Just the Coffee Talking: One of many companies I won't support or buy from - because mixing your personal politics with your business is just... stupid and rude. One of many companies I won't support or buy from - because mixing your personal politics with your business is just... stupid and rude. 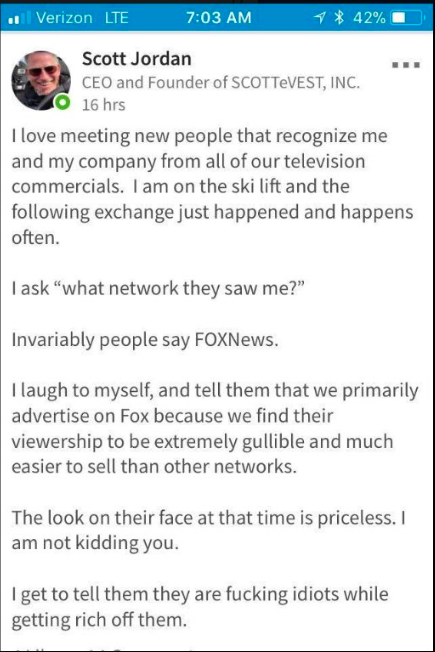 Source: It might not be good for business to mock Fox News viewers. Many on social media have vowed never to buy the multi-pocketed vests sold by SCOTTeVEST due to a now-deleted post from the founder and former CEO Scott Jordan, who is a 1983 Walnut Hills High School graduate. Jordan appeared on the third season of Shark Tank in 2012 with his vests designed to hold phones, iPads and other modern day essentials.